SUBHEAD: We need to work within the water, soil and solar budget that we have available. Image above: Former floating bathrooms at what was once a marina in the now depleted Lake Mead. 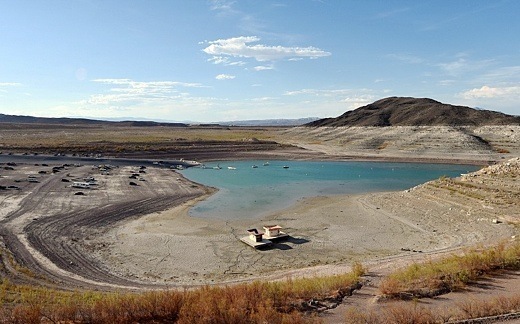 From (http://www.dailymail.co.uk/news/article-2692335/Water-levels-Lake-Mead-time-low-14-year-drought-leaves-marinas-abandoned-tourist-attractions-bone-dry.html). Las Vegas recently had a battle victory in their Water War. Since 2011 there has been a difficult and expensive effort to drill a new and lower tunnel into nearby Lake Mead (the largest capacity water reservoir in the United States). Without Lake Mead there is no Las Vegas. The previous tunnels into Lake Mead (called straws) are now too low to draw that last water resources from behind the Hoover Dam. Las Vegas has been facing extinction. But on 10 December 2014 a historic breakthrough was announced during a Southern Nevada Water Authority board meeting. The workers from general contractor Vegas Tunnel Constructors would guide the $25 million tunneling machine as it broke through the concrete wall of the intake structure already in place on the bottom of the lake, the last step in building the 3rd straw to supply water to the Las Vegas Valley. See (http://www.reviewjournal.com/news/las-vegas/historic-breakthrough-lake-mead-comes-during-water-board-meeting). But this will be the Last Straw for Las Vegas. This one is at the bottom of the lake. Unless the climate in the region gets wetter soon, or Las Vegas Valley can capture water from other parts of the drought stricken Southwest the area will return to undisturbed desert. 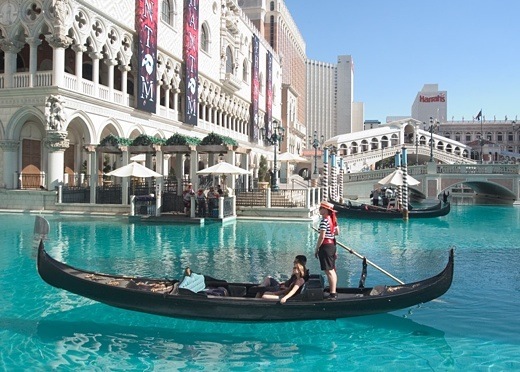 The Vegas gondolas of the Venetian Hotel & Casino will no longer ply their fake canals. Image above: Gondola in the canals of the Venetian Hotel & Casino in Las Vegas, Nevada. From (http://www.virtuar.com/click/2006/las_vegas/large_picture.htm). If the canals of the Venetian, the fountains of the Bellagio, or the sprinklers on the twenty "World Class" golf courses of Vegas were to go dry it would be no great tragedy. Nothing essential to the survival of human culture is conducted there. People would move on or adjust to the desert. A much bigger problem concerning water shortages is now facing the Central Valley of California - the fruit and vegetable "basket" of the Untied States.There 90% of the world's almonds are grown. In recent years that valley produced 10% of the agricultural economic output of the Untied States. 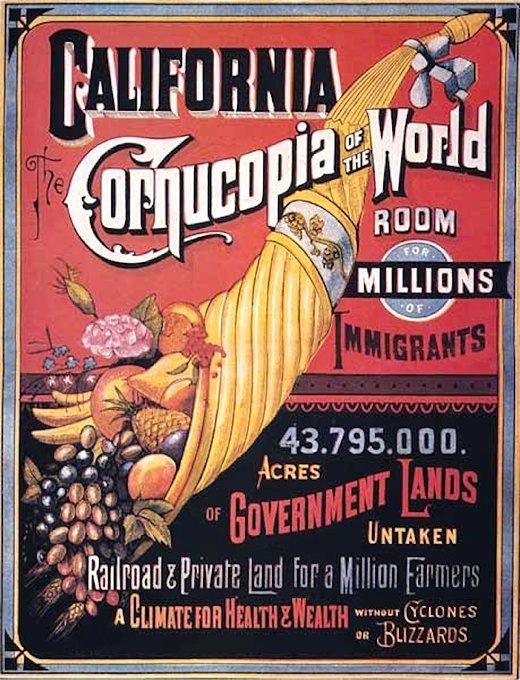 Image above: California once sought millions of immigrants by advertising itself as "The Cornucopia of America", and "The Promised Land". From (http://pocho.com/come-to-california-immigrants-1867-poster/). But now, in the middle of what is likely a Global Warming induced drought, and with the competition from encroaching residential suburban water needs, the Central Valley is in the process of sliding into desertification. On 16 December 2014 NASA published the results of a survey of water supply needs in California (see http://science.nasa.gov/science-news/science-at-nasa/2014/16dec_drought/). The conclusion: according to a new analysis of satellite data it will take about 11 trillion gallons of water (42 cubic kilometers) - or about 1.5 times the maximum volume of lake Mead - to recover from California's continuing drought. As a reference, the recent rain storms in California dropped an estimated 8 billion gallons of water. If it rained 8 billion gallons of water every day stating today it would take until almost 2018 for California to return to normal. 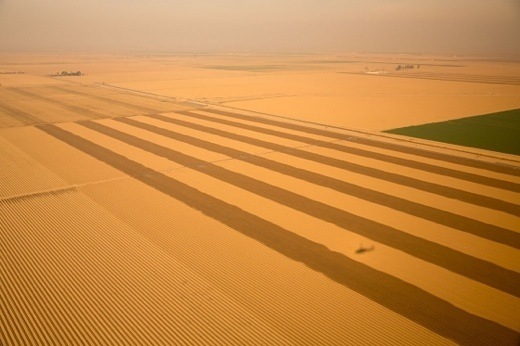 Image above: Aerial photo showing effects of drought in the Central Valley in California. From (http://www.nasa.gov/jpl/smap/satellite-data-help-farmers-facing-drought-20140814/#.VJHwUyf3DZM). Neighboring water authorities in western states have been emphatic they they will not share additional precious water with California. But other regions maybe the subject of scouting. "Waukesha is the first community to seek an exception to the ban on diversion of water out of the Great Lakes. The city of Waukesha, Wisconsin, wants to draw water from Lake Michigan. But to do that the Milwaukee suburb will need the approval of all eight Great Lakes states, and nods from a couple Canadian provinces. In the late 1800s, Waukesha was celebrated for its natural springs. But over time, the aquifer from which the city draws its water has shrunk, concentrations of radium have risen to unsafe levels, and the water has become increasingly brackish. Waukesha is under a court order to find a better drinking water source by 2018. “Even with conservation — even with the demand reduction we’re looking at implementing — we don’t have a sustainable water supply for the long term,” says Dan Duchniak, the general manager of the city’s water utility. After considering other options, including a failed legal challenge to the radium standard, Waukesha settled on a solution just 15 miles to the east: Lake Michigan. But the city lies just outside of the Great Lakes basin — and within, therefore, restrictions imposed by the Great Lakes-St. Lawrence River Basin Water Resources Compact, aka the Great Lakes Compact, the historic 2008 international agreement on protecting Great Lakes water. Water is life. Keeping it clean and slowing its runoff is a vital issue. Energy sources are certainly an issue for our health and well being. But a growth based economy will run into a cement wall when it comes to a lack of water. 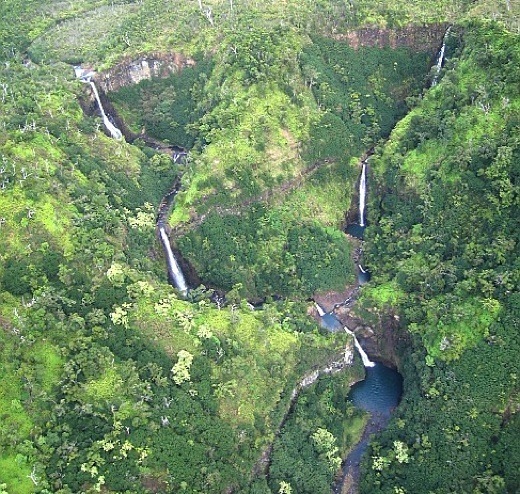 Image above: The Five Sisters waterfalls in Hanapepe Valley on Kauai. From (http://jame1030.fotki.com/favs/img_2027.html). We in Hawaii have been blessed with water. The sugar plantations and other private agencies have tried to control water. However the real threat to us is related to climate change. Change in temperature due to global warming, can raise the elevation of water bearing clouds. Even just a few hundred feet higher than current cloud altitudes would have a significant impact on the amount of rain that 5,000 foot high Kauai would receive if we could not skim the sky. We need to anticipate the need and apply permaculture practices to conserve, store and reuse water here on Kauai while we have some time. How water transforms itself in the clouds, on the ground and below it should be a focus of our hearts and minds. We need to work within the water, soil and solar budget that we have available. There will be little else to rely on in the future.